There are a number of mosques in every four corners of the world, and while they share some characteristics, sometimes they have a unique design. 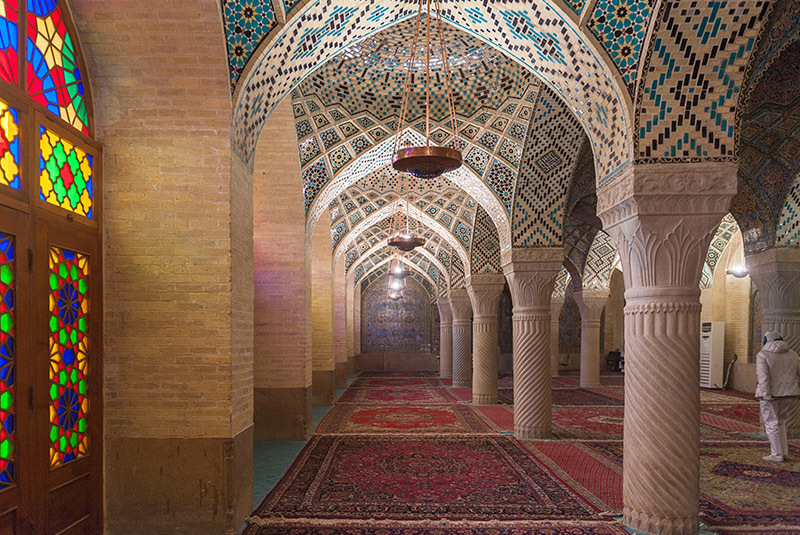 One of the best examples of an extraordinary mosque is Nasir-ol-molk Mosque, the magic of colors is what you can see at this magnificent place. When you look at the mosque from outside it looks like an ordinary mosque, however, when you put a foot inside, you will understand why it is named as Pink Mosque or Rainbow Mosque. Its interior reveals a magnificent masterpiece of design with stunning colors. A travel to Shiraz is not totally completed without having a visit to this wonderful mosque. Here, you can find a complete guide to Nasir-ol-molk Mosque. The mosque is officially named Nasir-ol-molk, named after Mirza Hasan Ali (Nasir ol-molk), who ordered its construction. 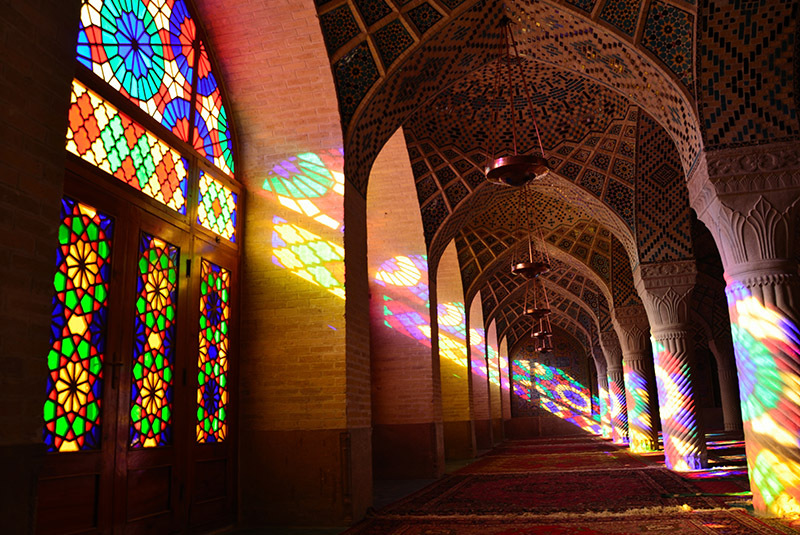 However, it is also called “Pink Mosque”, “Mosque of colors,” the “Rainbow Mosque”, and the “Kaleidoscope Mosque”. The building was constructed about 200 years ago, during the Qajar Dynasty, and is still in use under the protection of the Endowment Foundation of Nasir ol Molk. Construction of the building started in 1876, and completed in 1888, after more than ten years. Mirza Hasan Ali (Nasir ol Molk), who was a Qajar ruler, ordered the construction, and Mohammad Hasan-e-Memar, and Mohammad Reza Kashi-Saz-e-Sirazi were the architectures. Today this gorgeous mosque is still in use under protection by Nasir al Mulk's Endowment Foundation. 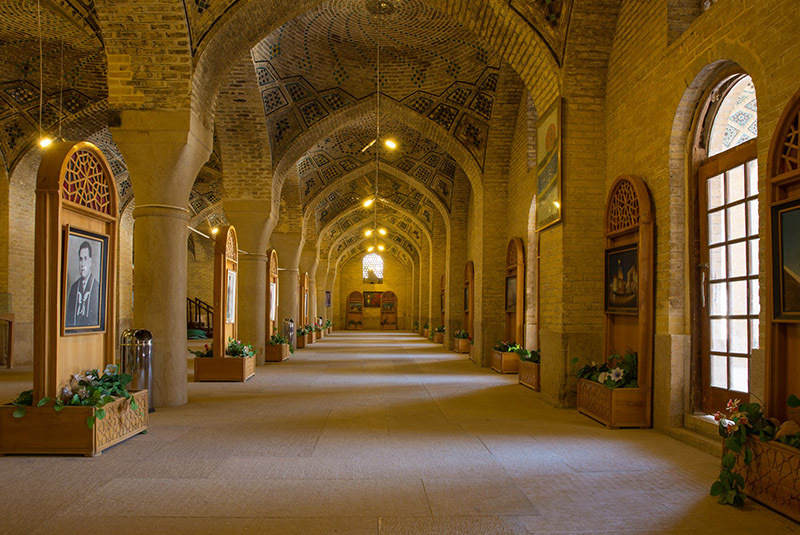 The Nasir-ol-molk Mosque is a two-ivan mosque, with a covered arcade on the left (facing the sanctuary). There are arrays of delicate mirror work and stuccowork, which are interwoven with arabesque designs and tile work. 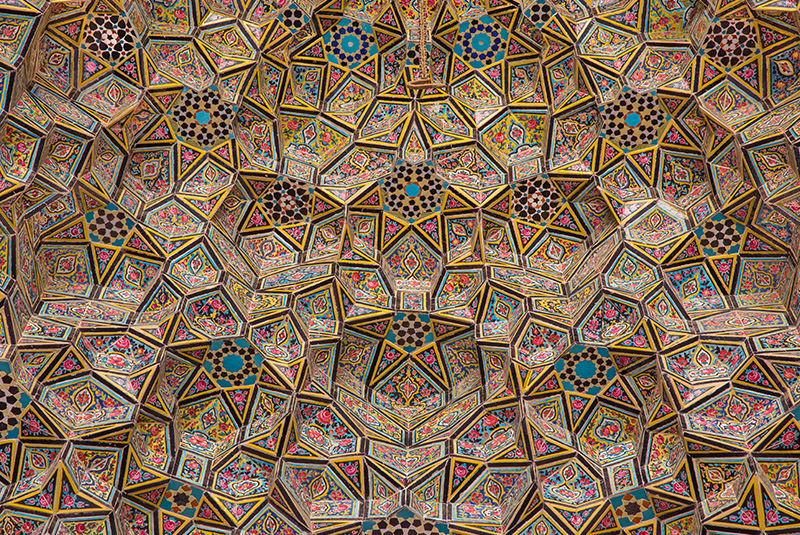 The architectures used extensively stained glass on the facade and other traditional elements such as panj kaseh-i (five concaves), which create a breathtaking effect of the interior like standing in a kaleidoscope. Once the sunlight hits the stained glass, the entire building is flooded by a vibrant rainbow of colors. Filled with carved pillars and lavishly-created polychrome faience, the prayer hall appears gorgeous when it is lit up through the vast stained-glass windows. The mosque is also home to a patchwork of handmade Persian rugs. The colorful windows and doors are handcrafted by carpenter master Hajj Mirza Ayat. To enjoy the most of the beauty of the mosque and its colorful shades, it is best to visit the place early in the morning, up to 10:00. It is because, after that, the sun will be quite high and the colored light will have just small colored prints on the floor close to the big windows. In the following, you can see some of the breathtaking pictures of this beautiful mosque, and truly understand why it stands as #1 of 61 things to do in Shiraz on the TripAdvisor website.